I made this Khadgar's Whisker farming guide to help out players who want to farm the herbs instead of buying them from the Auction House. It's recommended to have around Herbalism 160, so you won't get herb fragments. Khadgar's Whisker always grows near trees or other plants. There are two good zones where you can farm this herb (there is more, but these are the best ones), and they are next to each other, so even if someone is farming in one of them, you can try the other zone. I prefer Eastern Plaguelands because the farming route is easier to follow. 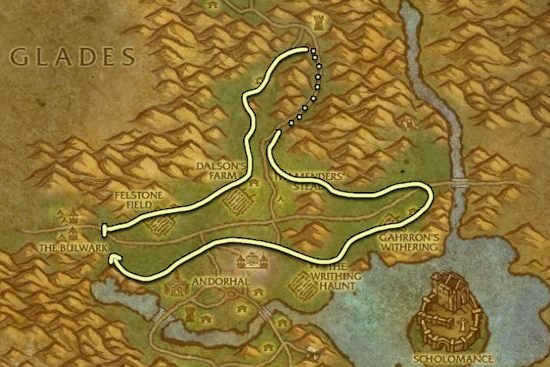 Khadgar's Whisker is not the only herb that you can pick at Eastern Plaguelands, you will also find a lot of Sungrass and Liferoot in this zone. The respawns rate is fast enough that you don't have to go to the upper part of the map where the red route is, but I included it in the guide so people are aware that there are herbs there too. 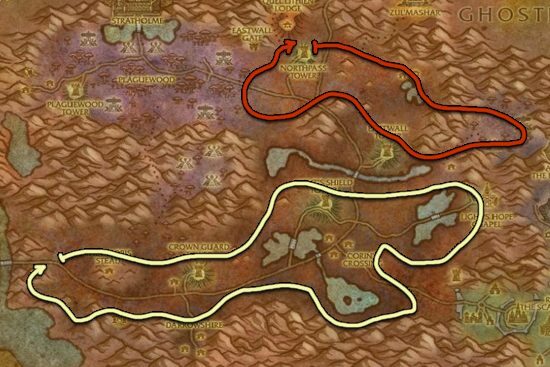 Almost as good as Eastern plaguelands, the difference between these zones almost comes down to personal preference. There are a lot of Kingsblood and Fadeleaf in this zone, so if you need those herbs too, you should choose Western Plaguelands.